“I am that I am,” God yelled at Moses when asked for his name in the book of Exodus. It’s not exactly the straightest answer to an honest question, especially when shouted from inside flaming shrubbery. You can almost hear Moses muttering to himself in the voice of Mel Brooks as he walks away. “I am that I am? What is this, Popeye? What am I supposed to do with that!” That’s the point, though. I am, Ehyeh, YHWH, and all of God’s other names are mysterious, an attempt to translate something ineffable into text and, by extension, help the human brain hold an ineffable concept. 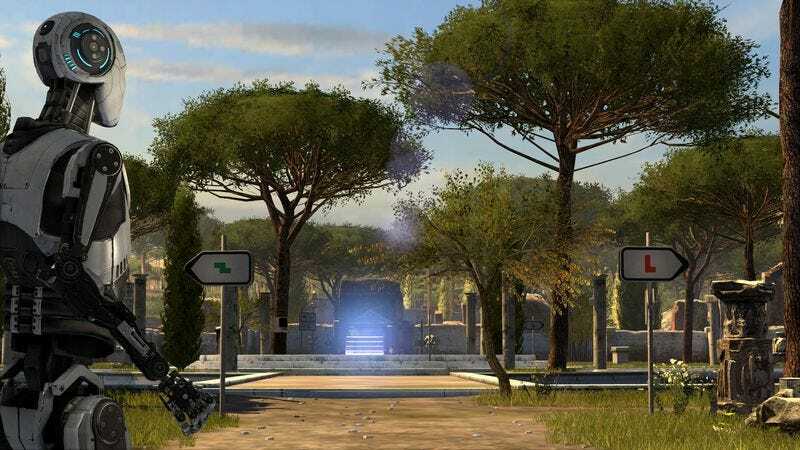 Trying to understand God—trying to understand why things exist at all—is the mystery Croteam’s The Talos Principle starts with and uses to explore what life is, whether human or artificial. As tends to happen when unraveling existential Gordian knots, definitive answers are scarce, but asking the questions is a stimulating exercise thanks to the game’s smart writing, cold atmosphere, and its many spatial puzzles. God’s a little bit chattier when you come to in Principle. Elohim tells you his name, that you’re his subject, and that you should seek entrance to his temple. The voice of God comes off as imperious and confident as you’d expect, but not all seems right with the world from the start. Stuck in a grassy, sun-drenched maze of crumbling buildings, impenetrable force-field doorways, and roving metal balls that are all too happy to blow up when you get close to them, only two things are abundantly clear: First, you’re alone; second, you are a robot. The game starts you playing in a first-person perspective, offering fleeting glimpses of a metallic hand when you pick up electronic jammers to stop exploding balls or jam force fields so you can sneak by. Jump into the options and switch to third person, and you can get a look at your blue and gray body in all its robotic glory. It’s the game’s first mystery to be solved. Well before you figure out just what Elohim is and where you are, you figure out what you are: a machine. That doesn’t answer who you are, though. Just because you know you’re not flesh and blood doesn’t mean you’re not a person. After reaching the first of Elohim’s three main temples, Principle settles into an appealing old-fashioned rhythm. Numbered doors lead to new court yards, each one leading to three or four individual spatial puzzles. Elohim commands you solve these to acquire artifacts, little blocks identical to those in Tetris, which in turn open doors to both new temples and new puzzle-solving tools. Principle’s stumpers strengthen its existential themes. Instead of getting crushed under the weight of ponderous navel gazing, you have something definitive to do. Figuring out precisely how to arrange three jammers so they simultaneously block a security bot, a force field, and a sentry gun while also leaving an opening to go back for a jammer to open a second force field gives your brain something to do while it tackles meaningful but ephemeral questions like, “What does it all mean? They also make the whole scenario even stranger and eerily threatening. What is this robot doing here? Why is God talking to it? And why does God want those blocks so bad? It’s only natural that the game’s so discomfiting. All spiritual inquiry comes with at least a little bit of fear that ideally presses you forward. The Talos Principle rewards persistence not just with more puzzles but partial answers to more immediate questions. What’s going on, why am I solving these puzzles, and who am I? Dotted around the classical Grecian, Egyptian, and Medieval European arenas are small computer terminals that both deepen Principle’s mystery and provide crucial insight. Old emails and articles and excerpts from an unfinished novel detail 21st century preservationist efforts to create the single most durable and memory rich computer in human history, as well as a drive to birth artificial intelligence. The terminals aren’t just passive narrative tools either. The archives appear to be partly corrupted, and your efforts to gain network access to the outside world are often met with tests—these multiple choice quizzes test whether you’re a person, and they come up inconclusive and are very funny. Each terminal gives just a bit more insight, while also making the whole game stranger. One found message from the woman leading the AI project explains precisely why your solving these puzzles, but it still leaves you wondering whether or not you’re the AI she was working to create. Who your god is in Principle is just as valuable a conundrum as who you are. As intricately paced and intelligently plotted as The Talos Principle is, though, it’s not flawless. The self-contained environmental puzzles and exploration of artificial intelligence’s sentience inevitably calls Portal to mind, which demonstrates just how rigid Principle’s puzzles can be. Part of what made Portal’s puzzles so illuminating was that they allowed for a degree of improvisation; you could use the tools you had available in unexpected ways to get you to your goal. The Talos Principle’s puzzles, however, generally have just one solution. The fans, blocks, and other new devices slowly unlocked throughout the game are only available in specific puzzles, but even then they have to be used just one way. That doesn’t make for poor puzzles. In fact, many of the medium-difficulty puzzles are ball busters and satisfying once cracked. But since they’re not particularly malleable, they don’t feel alive either. Playing games is a sign of sentience, according to your creator (or possibly Elohim’s creator? ), but so is breaking the rules. The Talos Principle is what it is, though, and inflexible puzzles don’t dim the inquisitive light shining inside this game. Croteam has made something rewarding and ultimately knowable but also something that inspires reflection on what isn’t.